modern rooms, equipped with every comfort for an unforgettable stay! Sourire Hotel has single rooms, double rooms and triple rooms. Every room is provided with air conditioning, a flat-screen TV with satellite channels, and minibar. The rooms are equipped with a private bathroom featuring a shower. It features free WiFi throughout and air-conditioned rooms. Sourire Hotel is placed in the centre of Rome, in historical and green Colle Aventino. The Hotel offers accommodation centrally located in Rome, just at 5- minutes from Circo Massimo and 14-minutes from the Colosseo, Fori Imperiali and Palatino. The neighborhood is full of bar, restaurants and stores. The extreme closeness to FAO, that is located 200mt from the Hotel, allows Sourire Hotel to be a great place to stay for those who stay in Rome for work. 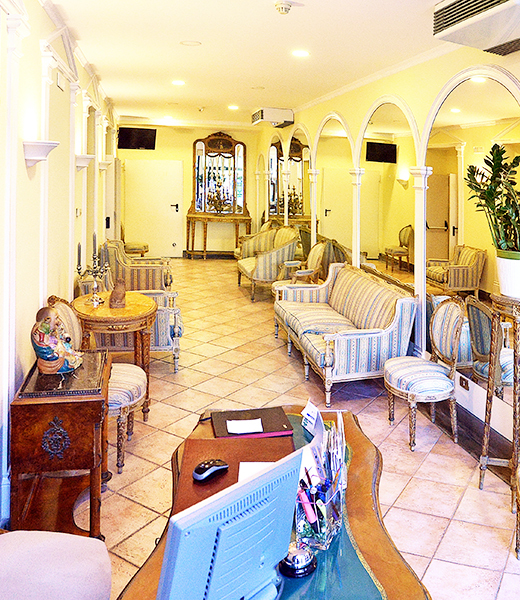 Hotel Sourire offers free Wi-Fi in both public areas and all rooms. Breakfast is served in the gazebo in the hotel’s garden. Copyright Ⓒ by Chiara Mazzapioda.